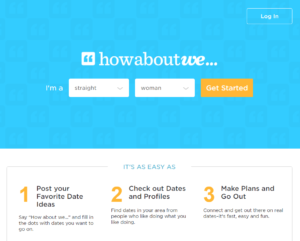 The HowAboutWe Dating App changes online dating to offline dating. Howaboutwe.com have developed a dating app for Android and iPhone which enables you to post your date ideas and meet with the people you like in the real world. Cutting through all the chatting, and profile searching the How About We App offers a simple way to setup a date offline through your mobile or tablet. If you are into meeting new people, without going through hundreds of profiles of singles dating in your area, you should download and install the How About We Dating App. So yes, it’s got all the regular online dating features, but the HowAboutWe App does a great job in helping you to find a date offline through your mobile phone or tablet; and does it fast. 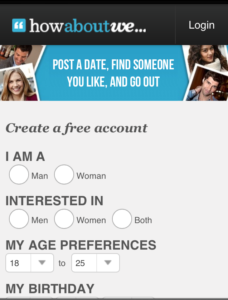 Users of iPhone and Android can post their date ideas via the HowAboutWe dating app and get responses only from members who like the ideas and share the same interests. HowAboutWe proclaims itself as the offline dating site for singles who are looking to date, find a relationship, or fall in love. The app has over 1,000,000 users so far and is home to a growing singles dating community as well as a big social dating community. If meeting your perfect match for dating in your neighborhood is what you are after then the How About We Dating App is just right for your mobile or tablet. If this app is not what you are looking for you are welcome to check other iPhone dating apps and Android dating apps which we have reviewed (and which you can download from us). For those not interested in downloading the app the HowAboutWe Mobile site is a good alternative. The How About We Mobile website offers the same functionality for your mobile phone or tablet, including the option to register and login. It is compatible with all mobile phones, so it will work on Blackberry, Windows Phone, as well as on Android and iPhone. All you have to do is open up your favorite browser on your cellular phone and go to howaboutwe.com (you will automatically be redirected to the mobile site). Browsing other members dating ideas. Read messages in your own email. Get boosted positioning on search results. Know when your messages have been read. If you are looking to actually go out on a date then the HowAboutWe Dating App is perfect for your iPhone or Android. It connects a large singles dating community which is looking to find love, a relationship, and to start dating in the real world without all the clutter of online dating first lines, chatting, and endless messaging. If you are into meeting new people and going on offline dates we recommend giving How About We Dating App a try. Download it to your mobile or tablet and see how fast you can go on an actual date. How can I save a profile I view on the App? If you are not sure about contacting someone you can add them to your “Favorite” list by clicking on Favorite on that profile page or on the star. This will save that profile for later if you wish to make contact. Can I contact someone who’s using the app from the mobile site? Yes you can. The mobile site has the same access to members who are online as the app. Is there a general inquiry contact?